Companies spend millions of dollars coming up with unique and compelling logos that define their brands and make them stand out from their competitors. 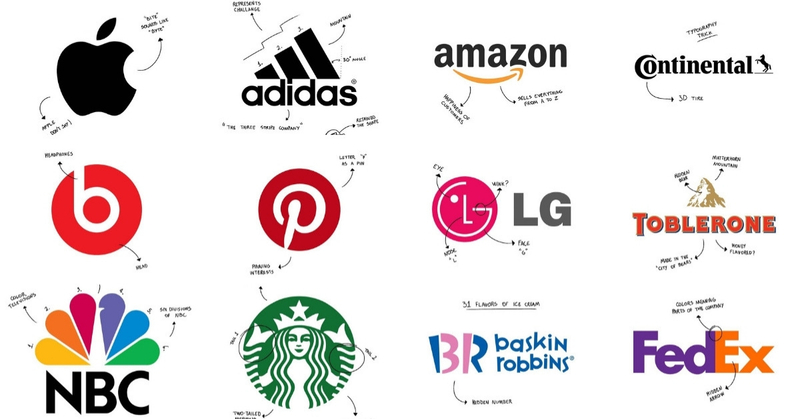 We see hundreds of them everyday, but do we really get what those logos mean? Here are 15 famous logos and the hidden meaning behind them. The name of Adidas is derived from the co-founder, Adolf Dassler. Three stripes of the logo symbolize a mountain, which in turn represents the obstacles, challenges and limits that athletes have to overcome. Amazon’s logo was designed to be rather simple meaning. The orange arrow serves two purposes. First, the orange arrow abstracts a smile, indicates the happiness or satisfaction of consumer when they shop with Amazon. And second, the arrow links the letters A and Z which means that the company sells absolutely every product imaginable. Simple yet effective! This world’s most recognizable logo was designed by Rob Yanov in 1977. In his own words, he claims that the logo of the bitten apple representing the personal computer providing individuals with access to knowledge. It was a happy incident that ‘byte’ is a computer term and there’s no truth to ‘biting from the fruit of knowledge’ symbolism myths. The four ceiling rings of the logo is rather simple to reflect the four automobile manufacturers (Audi, DKW, Horch and Wanderer) of Auto Union. Baskin Robbins is famously known for its 31 flavours of ice-cream. The pink-coloured areas of the letter ‘B’ and ‘R’ explicitly showcased the number 31. You might think that the Beats logo is pretty simple with a lower case ‘b’ comprised of a big red circle. Yet, there is more than meets the eye. The ‘b’ letterform represents a human’s head and it abstracts a person wearing headphones. Also, the red colour in beats logo reflects energy, excitement and passion. BMW’s logo colours (blue and white) is in fact simply derived from the Bavarian flag, the city where BMW originated. The logo symbolizes the blades of a spinning propeller, in line with the aviation history in 1920s. The letter ‘C’ and ‘O’ are placed closely to form a 3D tyre. The logo represents the company’s technological solutions are providing people the quality of their lives through mobility, and structure their living space in a sustainable way. Bet most of you have not ever noticed the arrow hidden between the letter ‘E’ and ‘X’! Such a simple logo, specifically the arrow denotes the ideas of speed and precision, much like the services of the company. At first glance, you might think that the LG logo is nothing special. However, there is a little detail where the letter ‘L’ and ‘G’ are stylized image of a person’s face. The ‘L’ abstracts the nose and the ‘G’ abstracts the rest of the face, giving the brand a human touch. One of the most colourful company logos, NBC’s peacock logo has a couple of interesting meanings. The peacock stands for colour and pride. This logo has since developed into 6 coloured tail forms when colour televisions were being introduced. The said 6 colours of the feathers represent each of the company’s departments (News, Sports, Entertainment, Stations, Networks, and Productions). Apparently, the legendary logo was created by the inspiration of an image. The company’s founders wanted to capture the history of seafaring and sea trade in 1971, and a logo of mermaid was then designed by Terry Heckler after searched through many old marine books. Toblerone, founded in Bern (aka City of Bears), Switzerland are folled with spiky chocolatey goodness! The logo features a mountain with a hidden bear in the middle, styling the unique honey flavour present in the chocolate and the fact that they’re made in the ‘City of Bears’. Toyota’s current logo represents an image of the eye of a needle with a thread passed through it, in line with the past history of the company which used to produce weaving machines. The logo is somewhat of a stylized “T” within a ring, form an overlapping of three eclipses/rings. The three eclipses symbolizing three hearts represents the unification of the hearts of customers and the company’s products. Pinterest is one of the popular internet site by most people when searching for inspiration or ideas. Users collect and ‘pin’ images into a board, symbolizes the image of a board pin hidden in the letter ‘P’. There you have it, incredible meanings behind these incredible logos. How many of them were you aware of, and how many took you by surprise?